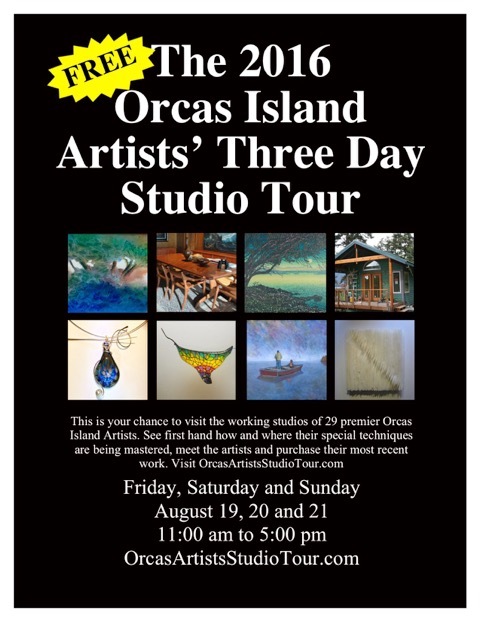 Once again, let’s venture down Orcas Island driveways that are off the beaten tourist track in the pursuit of art! From Friday August 19 until Sunday August 21, 2016, the free three-day, self-guided tour of enchanting art studios takes you all over the Island and will include artists of many different mediums – visit just a few or pack it all in. Come meet your favourite artists, get to know new ones, and buy directly from the makers. Block those summer dates for your trip to Orcas Island this year to coincide with the most art- and music-packed weekend of our Orcas event calendar. When the last studios close at 5pm, let yourself be carried away by the rhythms of the Orcas Island Chamber Music Festival. Art and music, a wonderful pairing!